Cape Town - Amajita defender Thendo Mukumela is confident that his first-team breakthrough with Mamelodi Sundowns will arrive before the end of the current season. Mukumela, 19, was promoted the Brazilians' first-team squad during the off-season by head coach Pitso Mosimane after impressing the club's technical team due to his rapid development with the junior national team and the MultiChoice Diski Challenge squad. Having represented South Africa at the U17 African Nations Cup, the U17 World Cup and the U20 World Cup over the past three years, the ball-playing defender went on to feature for Bafana Bafana in their recent CHAN and COSAFA Cup qualifiers. However, the presence of Soumahoro Bangaly, Thabo Nthethe, Wayne Arendse, Ricardo Nascimento, Motjeka Madisha and Rivaldo Coetzee means the teenager will have to remain patient for his chance. "I am adamant that I will make my senior debut this season," he told TimesLIVE. "Once I get that opportunity, I will make sure that I grab it with both hands. 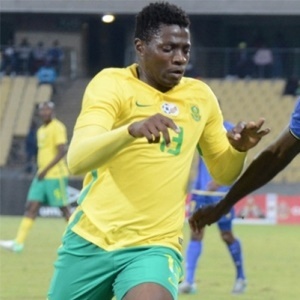 "I am listening to coach Pitso Mosimane every time he talks to me. He told me that I should wait for my opportunity... it will eventually come. "I do not take them as competition; they're helping me to settle in the first team." Mukumela went on to discuss the objectives of the Amajita squad, who are preparing for the Cosafa Youth Championships to be hosted by Zambia next week. "We want to win this [Cosafa] tournament; last year we lost in the final [2-1 to Zambia in Rustenburg]. We have now improved a lot and we have studied how other African nations are playing."